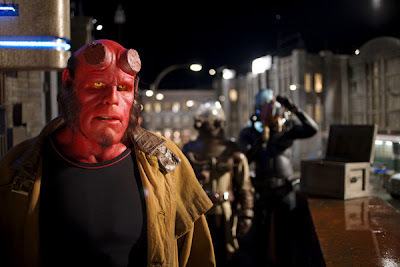 Checked it out last night and found myself disappointed from the outset w/ the poorly acted child Hellboy. Great visuals and some nice sequences throughout the film but I found the writing severely lacking and with way too much emphasis on one-liners, over-the-top characters, and corny attempts at humor. A drunk, love sick Abe is one thing but please, oh please do not deliver 1/2 human, 1/2 demon kids in any future sequels! Let me begin by stating the things I left out of my review. The brother/sister crap about how one feels the other's pain was very lame. If the Princess felt that the only way to stop the war with the humans was to kill her self, then why didn't she do that in the beginning? For the Prince, why did he choose this time to start the war? I could have seen some dire need to be fought during the WWs. So is he back to stop global warming? Ok. I'll go with it but what was his motivation? Mind you, I agree with most of your review but this was no Pan's or Hellboy 1.